Tropical Depression Marty degenerated into a remnant low pressure area early on October 1 after NASA's RapidScat captured a look at its waning winds. At 8 a.m. EDT on September 30 the International Space Station (ISS) passed over Tropical Depression Marty when it was leaving the southwestern coast of Mexico. The RapidScat instrument that flies aboard ISS identified a very small area of strongest sustained winds in the northern quadrant of the storm at a rate of 24 meters per second (53.6 mph/86.4 kph). Sustained winds around the rest of the system were a lot weaker, near 9 meters per second (20 mph/32 kph) or less. At 5 a.m. EDT on October 1 the National Hurricane Center issued its final advisory on Tropical Depression Marty as the storm's winds had diminished and Marty had degenerated into a remnant low pressure area. 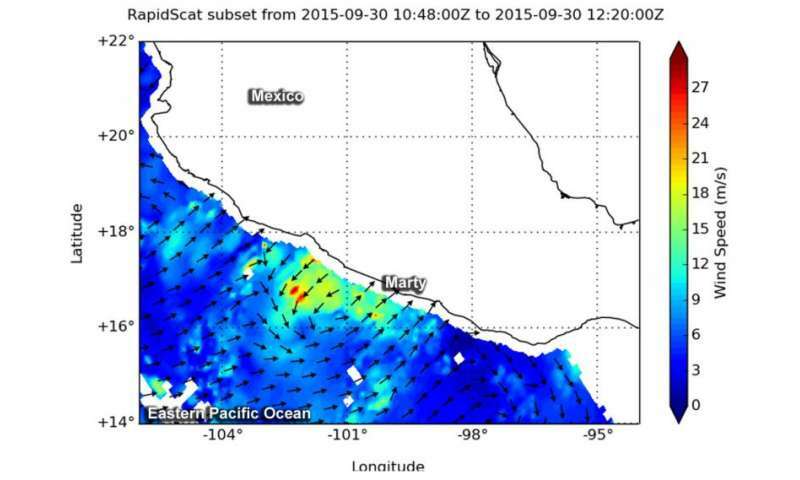 At that time the center of Post-Tropical Cyclone Marty was located near latitude 16.7 North, longitude 104.4 West. That put the center about 160 miles (255 km) south of Manzanillo, Mexico. It was moving toward the west-northwest near 9 mph (15 kph), and that motion is expected to continue through the day. Maximum sustained winds were near 30 mph (45 kph) with higher gusts. The National Hurricane Center noted that the remnant low pressure area is forecast to dissipate in a day or so.